Building upon the long-term success of the classic Thunderbird bass which has become a virtual institution in pop music, Epiphone introduces the new Professional Series Thunderbird™ PRO. 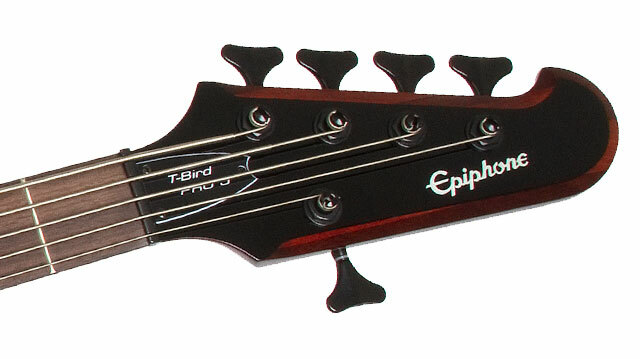 Available in both 4 and 5 string versions, the Thunderbird is the rock and roll bass with the distinctive shape. First released in 1963, the Thunderbird Pro combines traditional design elements with cutting edge technology and all for a price that the working bassist can afford. Like all of our instruments, the Thunderbird Pro comes with our Limited Lifetime Warranty and Gibson 24/7/365 customer service. Visit your Authorized Epiphone Dealer today and get back to a new future and soar with a Thunderbird Pro from our bass collection. The Thunderbird PRO features mahogany body wings and a rock-solid, 7-piece (Walnut/maple) neck with through-body construction for amazing sustain and tone. The Thunderbird’s SlimTaper™ profile neck has a 34” scale length and a rosewood fingerboard with a 12” radius and 20 medium jumbo nickel/silver alloy frets. The nut width on the 4-string model is 1.50” (1.93 on the 5-string model) and the body is finished in 3 striking colors including Vintage Sunburst (VS), Translucent Black (TB), and Natural Oil (NO). The Thunderbird Pro features Epiphone's new T-Pro bass humbucker pickups which include custom active electronics and EQ. 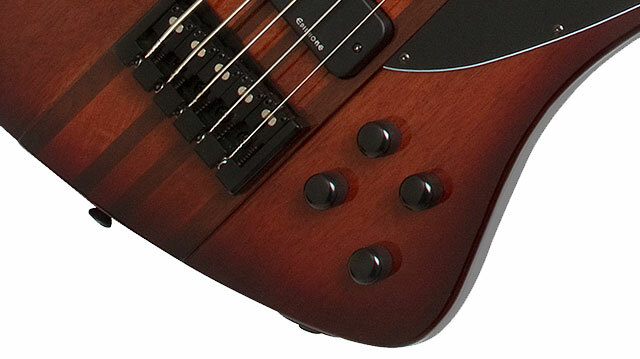 The pickups are powered by a 9-volt battery which is easily accessible in the back of the body. No previous Thunderbird model has ever sounded like this! Epiphone hardware is the best in the industry and the Thunderbird Pro features premium die-cast 17:1 bass machine heads, a BadAss™ fully-adjustable bridge, black hardware and black pickguard with silver Thunderbird logo.